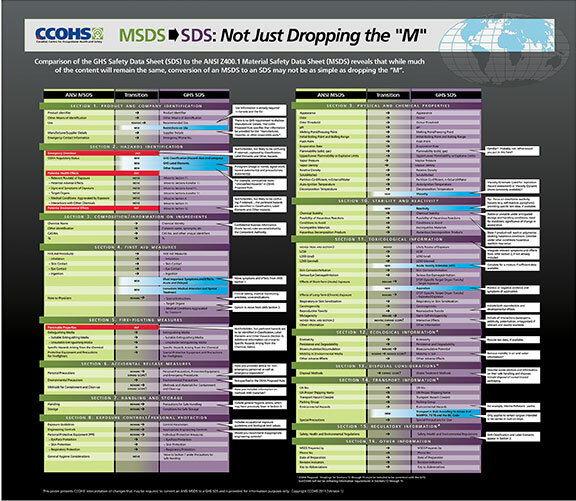 A visual overview of what an MSDS will look like after its transition to a GHS SDS. With the impending implementation of the Globally Harmonized System of Classification and Labelling of Chemicals (GHS), many suppliers will be transitioning from an ANSI MSDS (Material Safety Data Sheet) format to the GHS SDS (Safety Data Sheet) format. This transition will not be as simple as dropping the "M". CCOHS has evaluated how the ANSI Z400.1-2004 MSDS data fields can be transitioned into an SDS considering: what's in, what's out, what's new, what's moving, what is being renamed, and what is staying the same. 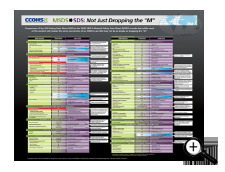 This poster will help you prepare for these changes by graphically presenting the results of this analysis, and highlighting some key tips about how to successfully manage your transition from MSDS to SDS. Please note that this reference poster is printed single-sided, and is available in English or in French. This colourful poster is designed to educate, train, and inform chemical manufacturers and suppliers, and employers and employees of industries where chemical products are used. Note: The information provided in this poster should not be regarded as final or unchangeable, since the final regulatory changes are not yet known.